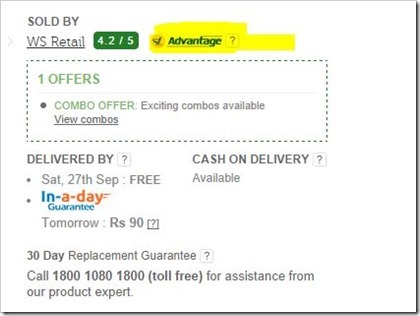 Flipkart now seem to be showing up a new badge on their product buy pages – Called “Flipkart Advantage”, it is exactly same as “Fulfilled by Amazon”, where Flipkart offers stocking and shipping service to the merchants selling their products on Flipkart. The time of launch seems to be quite interesting because this is exactly the service due to which Amazon has got into big trouble with Karnataka tax authorities. Customers will have additional benefits for products with this service – it allows for 30 Day hassle-free returns on products as well as expedited delivery options such as Same Day/In-a-Day Guarantee Delivery. Customers will also get detailed overview of their order journey from the Seller to your doorstep. While it has not been mentioned explicitly by Flipkart, here is how this service will work from merchants point of view. They will need to stock their products at Flipkart’s warehouses even before the orders are placed. Flipkart will let the merchants know the quantity of products based on intelligence they gather from history of orders for that products. As products will be available with Flipkart itself at the time order is placed, quality checks and expedited shipping is possible. This also helps merchants because they do not have to worry about logistics part at all. They can just concentrate on selling their products, while Flipkart does the rest. Amazon has had similar “Fulfilled by Amazon” service since long, however recently they got into trouble with Tax authorities due to it. With Flipkart too launching this service, it will interesting to see if they go behind Flipkart as well. The silver lining though is that Karnataka Government has asked the Tax authorities to go easy on eCommerce sites until such time that an amicable solution is arrived on various points that are in contention. I come here to say about a problem, I want to buy a smartphone Le 1s , which has delivery option only through you , but the problem is my address pin no.is 801503 , danapur cantt , Patna, Bihar which is not acceptable by you . I need the mbile most . Respected sir I therefore request you to please look into this matter and help me to receive excellent services given by ” F Advantage” . I will be great thankful for this.